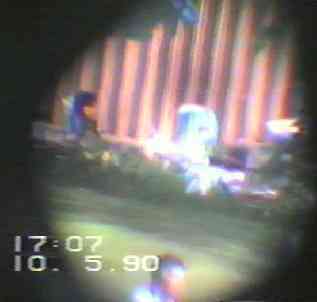 Covert video surveillance The famous Sol videos! Where, how and why they were done. West side of Solbakken II at Emma Hjortes Hjem institusion for the mentaly retarded. 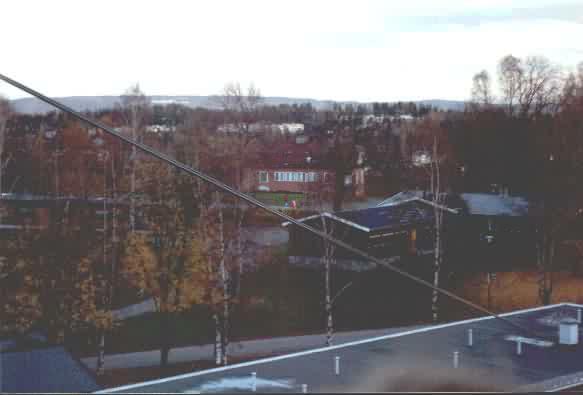 This picture was taken from the veranda of the Akershus College, Faculty of Welfare Nurse Education and Training (Vernepleier høyskolen). Distance from the camera to the window was roughly 33 m. The camera platform was hoisted with flag line and pulleys over 20m up the tree (just under the fake crows nest). 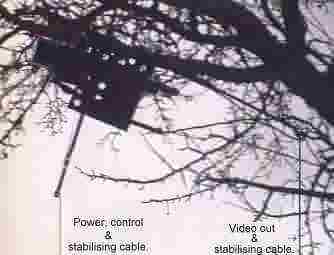 The video and power cables were used for positioning and stabilising the platform. View of the building without the telescope lens at night. This picture is from ground level the base of the tree. The camera is about to be fitted with the oil can telescope lens and hoisted up the tree too 2-3 meters below the fake crows nest. Rigging up this system in the dark without detection was no easy affair. 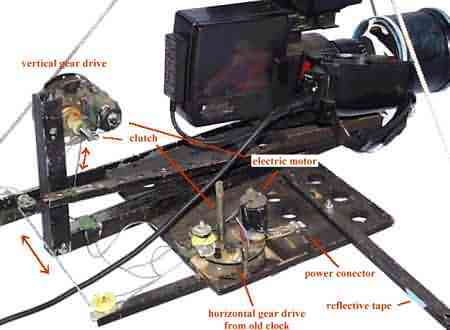 Their were lots of (long) wires and cables, motorcycle batteries that needed to be kept upright to avoid short circuiting or spilling acid on video equipment, lines, pulleys, hooks. In addition everything needed to be camouflage painted. Nylon lines for hoisting up the camera were darkened with black and brown shoe polish. If it wasn’t freezing cold it was usually wet, muddy and slippery. 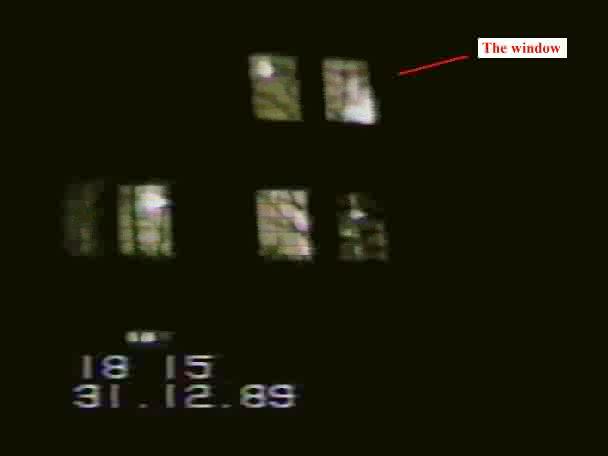 It normally took at least 45 minutes to get the camera up the tree, pointed at the correct window and start filming. The fake crows nest was built and installed 1987. 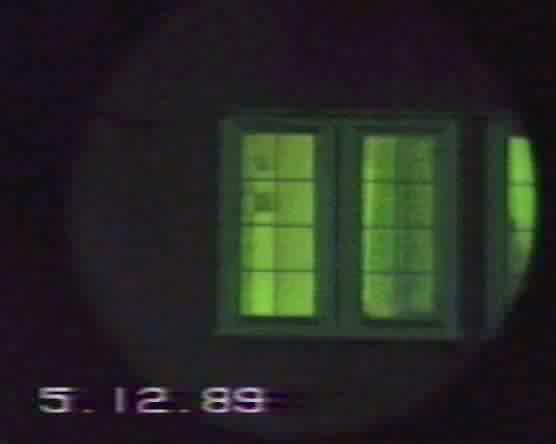 Its purpose was to allow surveillance during the summer months when it is light in the evening making covert activities difficult. A black & white video camera was to be installed in the crows nest. A power cable was sewn under the grass with a giant sewing needle to "borrow" power from the school. The video signal was to be sent ca. 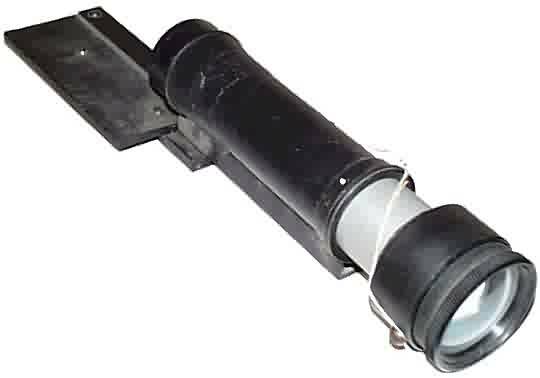 400 m via an infra red link to a location where the could be monitored and recorded. Because of general problems getting this system to work reliably and lack of financing this project was abandoned. But the crows nest remains. 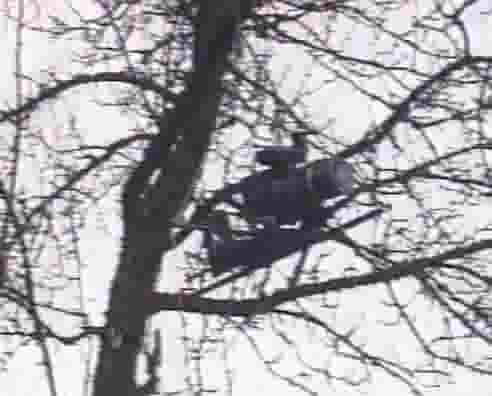 Below are two photos of the camera and platform in a tree. Small pieces of reflective tape aided in rough positioning in the dark. Close-up of the camera and platform. "Joystick" control switch. For aiming the camera platform right left / up down. Green luminescent panel to facilitate use in the dark. 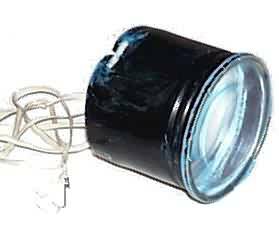 Simple oil can Galilean telescope. Simple (non-achromatic) double-convex objective lens (from an old overhead projector) and a simple double-concave. Housing was made from an old plastic motor oil can. The oil can was great, but the simple overhead projector lens gave un-sharp images and chromatic aberration. In the frame below Sol was eating her dinner. Sols head is directly in front of the staff (the normal person with the fist). 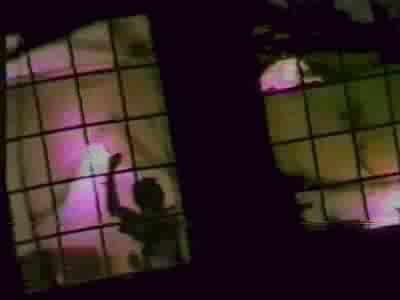 As the frame is dark only her hands are visible (lower 3dr window pane from left.). In this situation the normal person is exhibiting rather crude table manors. This equipment was used in 1990. It was getting too light in the evening for filming from the crows nest on the west side of Solbakken II. It was also risky as several journalists and the institutions priest had been shown the videos taken from that location. (Journalists talk too much and I don't trust religious people.) Therefor attention was directed to the east side of the building. 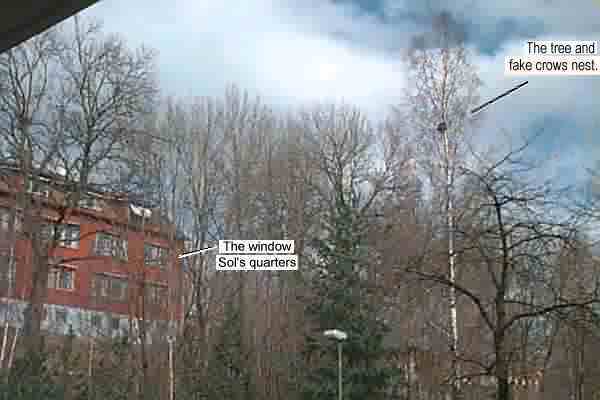 The camera was set-up in the staff housing and aimed at the east side of Solbakken II with a 3 hour tape. Hear the staff are in a public situation where they know they can be easily observed. 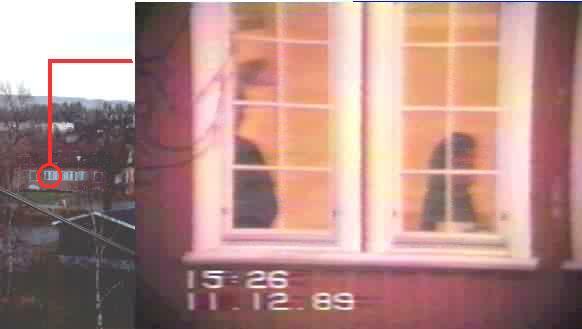 At this time several journalists had reported that they had seen the covert videos and described the mistreatment. April 06 1990 the LFA filed a complaint and the institutions administration was under police investigation. In spite of this several videos of rather rough treatment were filmed in this public situation during this period. Some of these videos are found on Arild Karlsen's page. 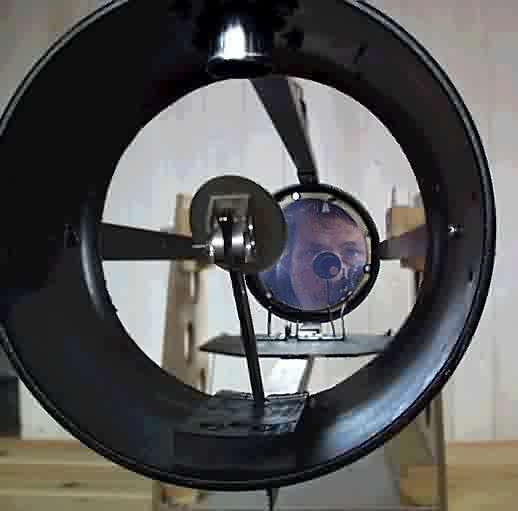 Video Galilean telescope made from a copy machine lens. 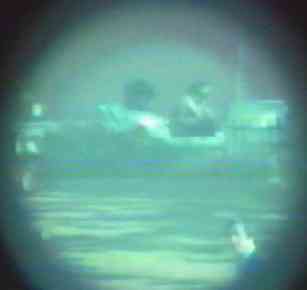 Galilean video telescope lens of considerably better quality made from a copy machine lenses. Both lenses are achromatic and give a much sharper image. The camera is bolted on to the small platform. Below are two pictures of me in the foreground and Sol in the background. I'm about 30 m in front of Sol. The image is not sharp however the distance to the camera is about 218 m and we are filming through is a triple pane window at an acute angle. Hear is a picture of Solbakken II taken from the same position without the telescope lens. A person with a red coat and blue jeans (center of picture) is standing in exactly the same place that I was in the two photos above. made from an aluminum frying pan and aluminum cooking pot. Close up of the aluminum cooking pot with the diagonal mirror. 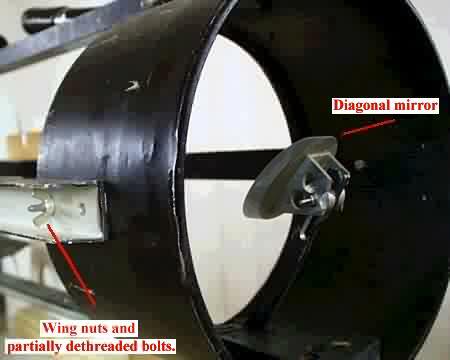 Wing nuts and partially dethreaded bolts to facilitate assembling in the dark with cold fingers. The telescope is rather large, slightly more than 1 meter. However it can be easily dismantled and transported without attracting too much attention. 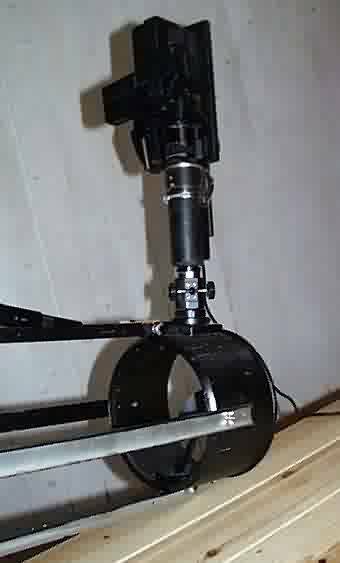 Fortunately a reflector telescope functions well even when the system is radically out of alignment. Below is the telescope dismantled. Below with the video camera mounted. Back to Richard Norton's homepage.